We all love an underdog. From Robert Kubica to Brendon Hartley, the public adore watching the unfairly judged work up through the rankings. The same can be said for cars, as largely ignored innovations in style and engineering often come of age with a new breed of automotive enthusiast. 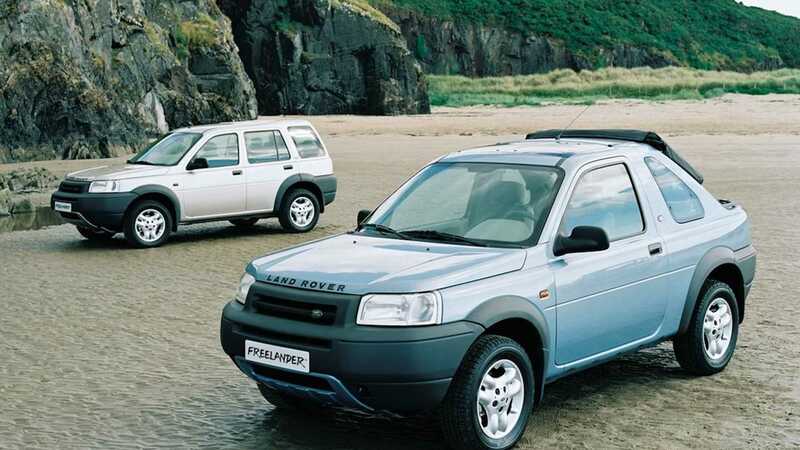 It’s within this category of underdog that you’ll find a genuine British workhorse with true vagabond nobility; the humble Land Rover Freelander. We can just imagine your bewilderment at that statement. 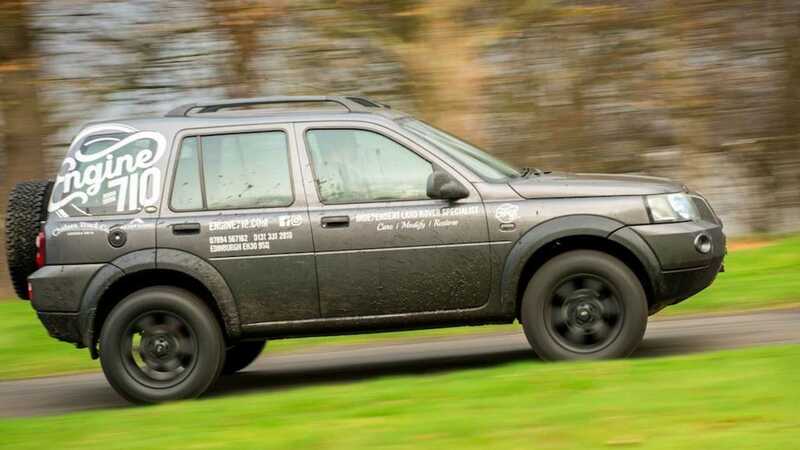 Still found cluttering up roads around the globe in vast numbers, the Freelander MkI is far from landing on the endangered list. It has blended into the fabric of suburbia with such grace that – a bit like post offices and telephone boxes – you’ll have either seen one or been near one every day of your life. In any given corner of the UK, these trusty 4x4s can be found hard at work on farms, stables and construction sites, or carting children to school and undertaking commuter duties. They offer comfort, refinement and usability on a budget. Without recognition or celebration, the unassuming Freelander MkI has supported livelihoods and small businesses across the world. Gerry McGovern’s original design may now seem dated, but back in 1997 it provided a much-needed injection of functionality and style into an otherwise monotonous and, frankly, pointless soft-roader market. 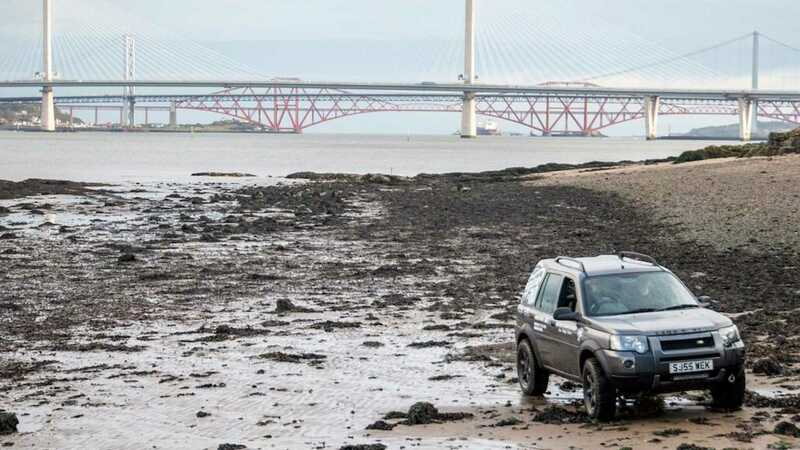 However, while its maker hit upon a delicate combination of all-terrain ability and on-road manners, which soon saw the Freelander declared Europe’s biggest-selling SUV, the baby off-roader remains shunned. Neither the bigwigs in the Land Rover enthusiast scene, nor automotive know-it-alls who dictate what constitutes a modern classic and what is a complete lemon, offer an olive branch. Those within the 4x4 market lament the model’s lack of ground clearance, while Tarmac-only users find the build quality and Rover K-series engine something of a nightmare. 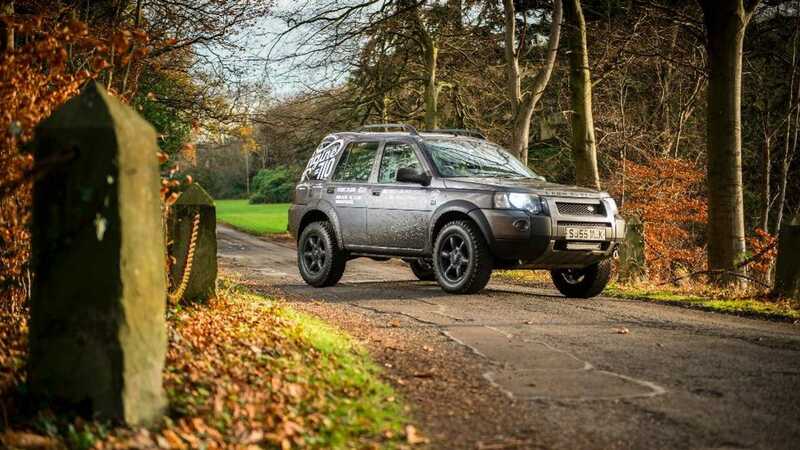 Regardless of your personal view on what enthusiasts call the ‘Hippo’, it’s testament to the Freelander’s tenacity and strength that such vast numbers have survived nearly two decades of harsh everyday treatment. It was even granted ‘heritage’ status by Jaguar Land Rover in January 2016, so it’s now officially and unquestionably a ‘proper’ Land Rover. 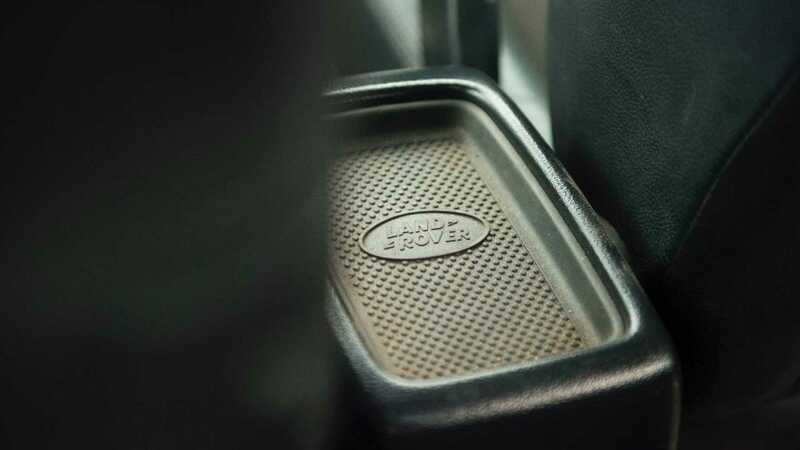 As a point of history, the car’s design was the last to be conceived under Land Rover’s original parent company, Rover. 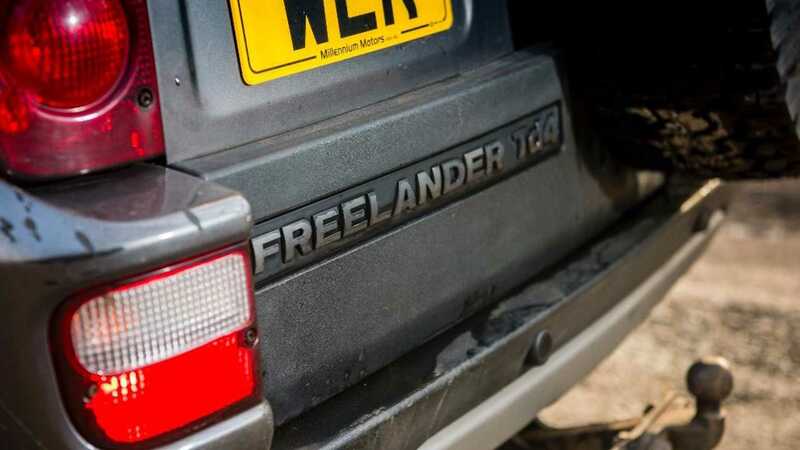 The Freelander was an apt swansong before Ford and BMW changed the course of Solihull history forever, seeing in new generations of Range Rover and Discovery as well as major political and managerial changes. 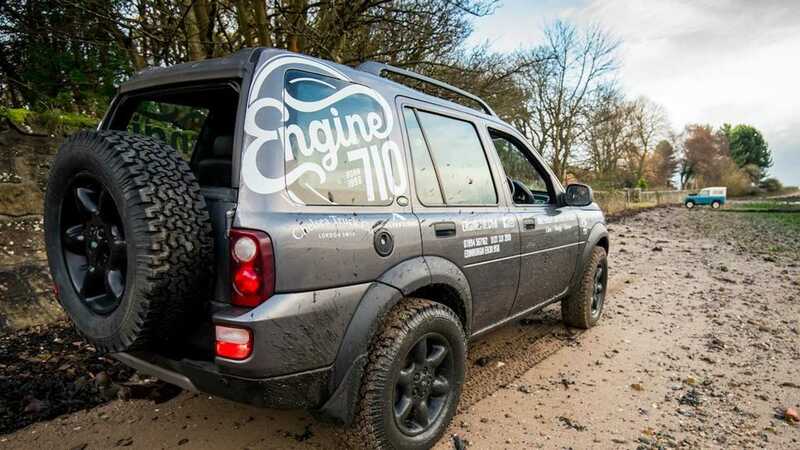 As the Internet forums and publications are chock-full of Freelander MkI criticisms, we decided something special had to be undertaken in order to prove our point. 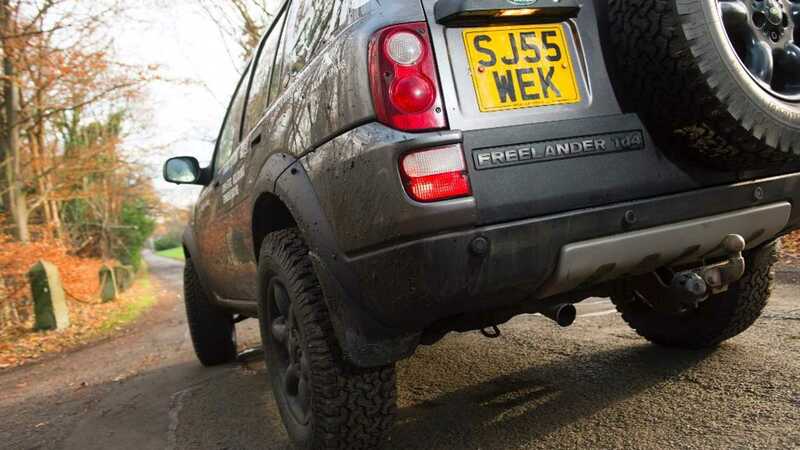 While a stock example is more than capable of tackling most terrain, for what we had in mind off-road tyres were the very least of what we needed. 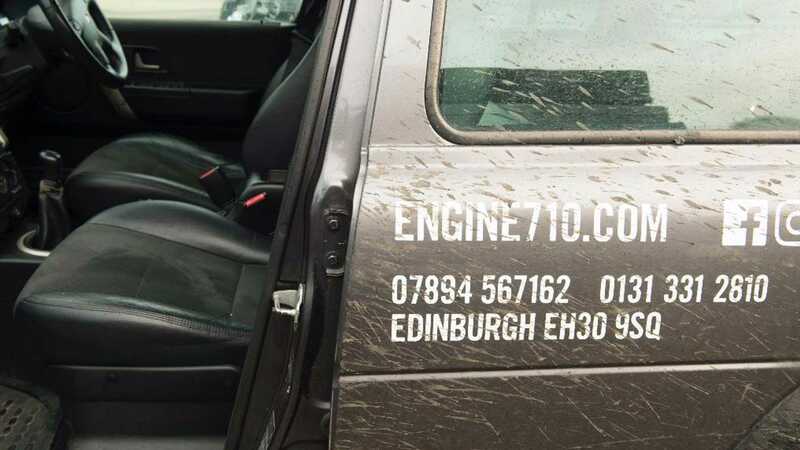 This is why we turned to Ben MacDowell of Edinburgh-based Land Rover specialist Engine 710. Ben’s breathed-on Freelander remains mostly untouched to the naked eye, but there is muscle lurking under the skin. 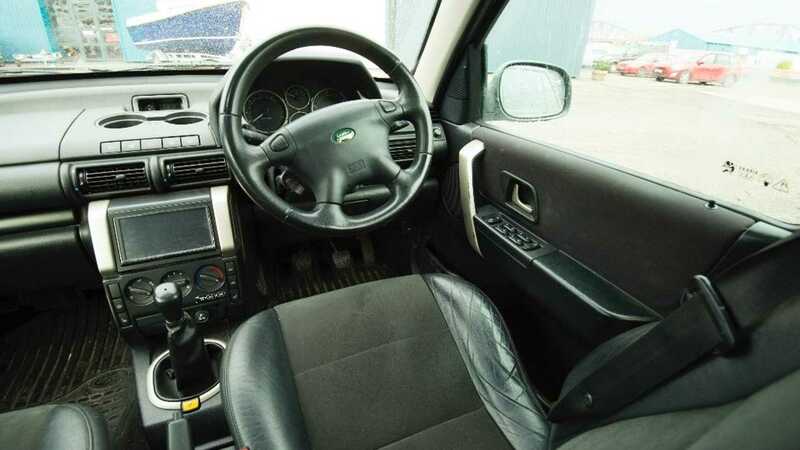 Inside, you are greeted by a variety of Rover parts-bin trim, dials and switchgear, alongside a chunky steering wheel and upright driving position that immediately confirms this is no lame duck. A Suzuki Vitara parked nearby looks rather uncomfortable in this Land Rover’s presence. Ben’s example is somewhat enhanced, posting a 0-60mph time of 10.5 seconds and a touted 115mph top speed. On-road handling feels rubbery if pushing hard, which is to be expected with the upgraded Ranger off-road tyres, but the clutch and drivetrain appear well suited to the eager 2.0-litre Td4 turbodiesel. Ride comfort is compromised, but not by much; lairy behaviour would cause lurching even in a stock model, let alone when these aggressive mud-pluggers start to plead for mercy on tight bends. Still, for a tuned soft-roader, the on-Tarmac mannerisms remain enormously impressive. However, it’s off the beaten track where the Freelander most impresses. The tuned Hippo crests almost anything you throw its way with the eagerness and agility of a mountain goat on steroids. It attacks frankly crazy inclines with scrabbling efficiency, while ploughing through water is child’s play. 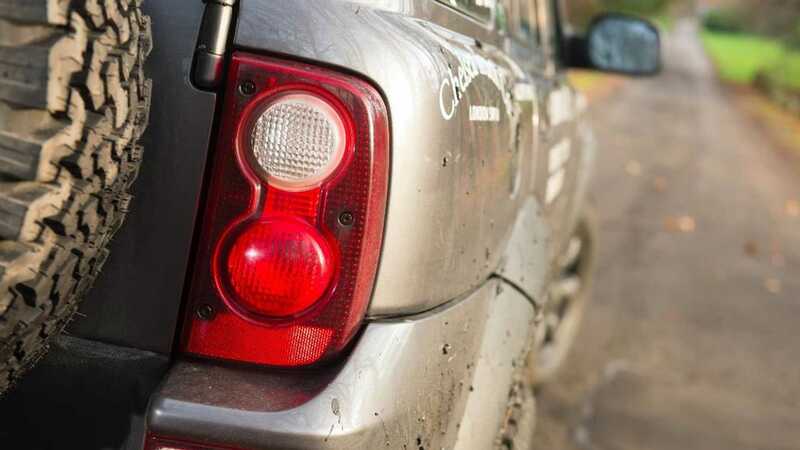 Grass and mud are trampled with ease thanks to the grip offered by the vehicle’s stance, and the steering – so often slightly ambiguous over undulations – relays instant feedback to keep up momentum and traction when the going gets tough. However, the fields and tracks of South Queensferry remain inconsequential compared with where the Hippo’s nose is pointed next. 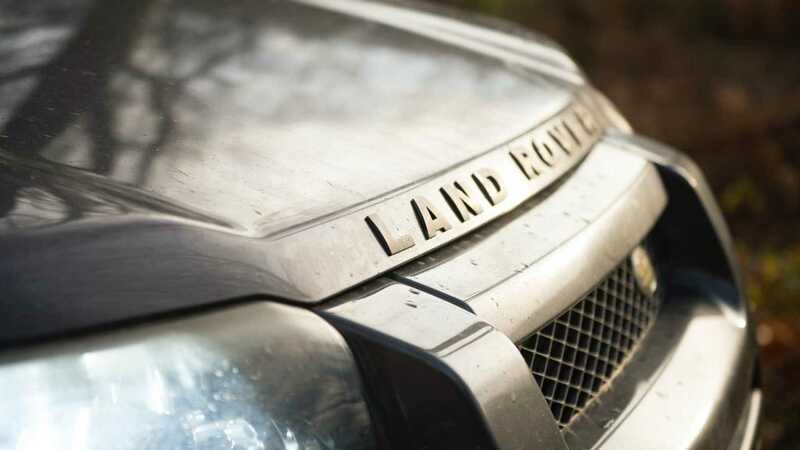 Arriving on the rocky shoreline of the Forth estuary, a stone’s throw from the North Deer Park and grounds of Midhope Castle, we find a gated entrance large enough for the Land Rover to slide through. We land on a long, disused slipway coated in seaweed and all manner of green, oily slime. Being this close to Dalgety Bay, strong chances are it’s probably radioactive – but the remnants of buried World War Two luminous aircraft dials are the least of our issues; we have the tide to contend with. Clashing water currents and extreme depth drops mean the Firth of Forth effectively has two pulling forces, creating one of the strongest tides to swirl on UK shores. 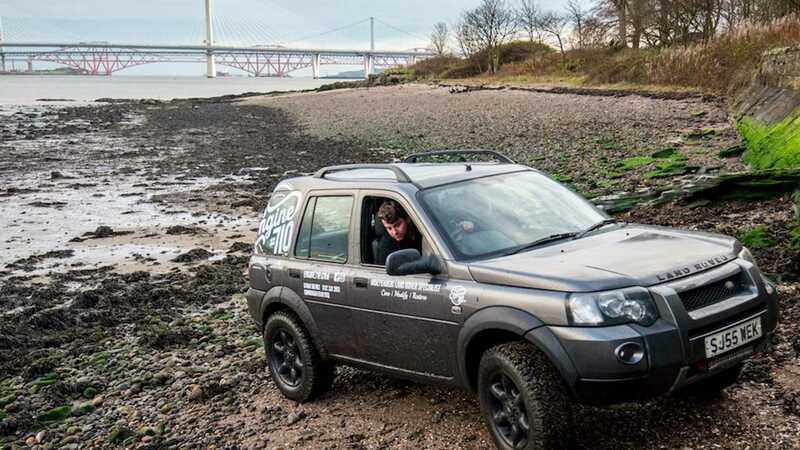 If Team Freelander was to find ourselves stranded or with the tide coming in around us, we’d be done for. 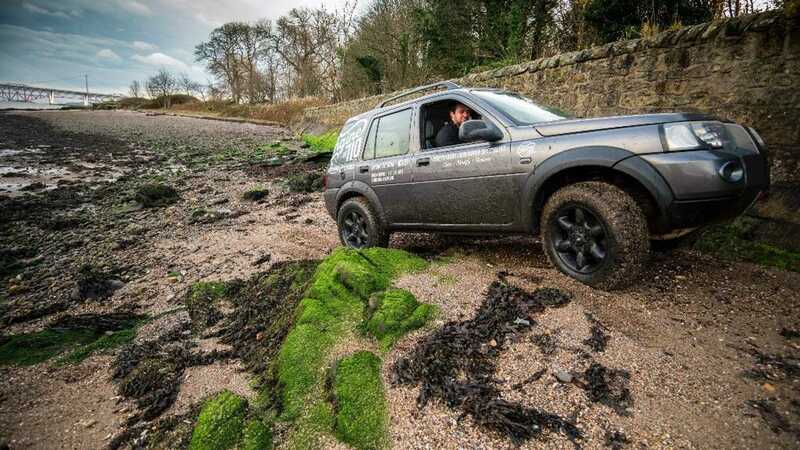 As we gingerly pick our way across the rocks and sand, the burbling Freelander can almost sense the oncoming challenge; to reach the furthest point before the tide forces itself back towards land. While such a quest may appear irresponsible, Ben has driven this beach several times with far larger 4x4s – and we have a classic Land Rover Series III 88in as a back-up should the worst happen. No car has made it that far out and back again before our attempt – it’s hardly the stuff of Guinness World Records, but it’s still quite an undertaking. To anyone reading this from the local area, please do not try this unaccompanied – or even at all. Presented with axle-deep, glutinous, salty mud, we need to keep the engine revs high. 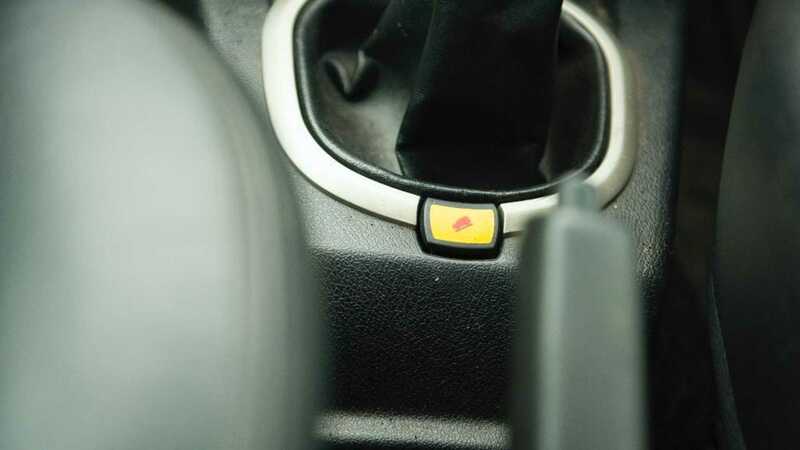 If we cause wheel slip, the traction control will engage to ensure momentum doesn’t stop. I’m not behind the wheel for this endeavour; Ben’s knowledge of the terrain means the venture is far safer with his expertise pulling us through. As soon as we set off, the going is relentless. The screaming Td4 in full battle cry is equalled only by the noise of the Freelander’s tyres sinking into the mud. The tidal sludge sprays the bodywork like a demented Catherine wheel, firing dank-smelling slop over the roof and across the windscreen. Even though there is no rain, the spray and copious amounts of slurry employ the wipers at full pelt. The sense of impending doom is hard to ignore, our marker – a rocky plinth draped in black gunk – puncturing the horizon like a stony Grim Reaper. Ben wrestles with the steering wheel, swaying the rear end back into line to counteract the crabbing motion that almost costs us all forward momentum. Careering on the edge of 5000rpm, no gearchange is required. The unit’s torque curve feeds command through the four-wheel-drive system with devastating effect, even with the Freelander’s entire underside now pushed under the soft surface. It’s with great relief that we reach the marker, mounting it at speed before slamming on the anchors to avoid ending up nose deep on the boggy wasteland beyond. There’s no time for celebration; with the tide already coming in around us, it’s imperative that we head back immediately. Except it isn’t that straightforward. Ben has to perform the mother of all three-point turns; should he overestimate the space required, his Freelander would be left on its side for Poseidon to claim. As tensions rise along with the waterline, we realise our previously trodden path is unsuitable for the return journey. Should we challenge the same tyre grooves again, our watery fate would be sealed. Drawing the short straw, I’m sent out to test the ground on which our escape route will rest. Unfortunately, I don’t even get that far from the rock of death before the tide breaches the Freelander’s position. It may not be a storm surge, but we’ll be in trouble if we hang about. Ben wastes no time and heaves forward, bellowing at me in an admirably dignified tone considering our situation. 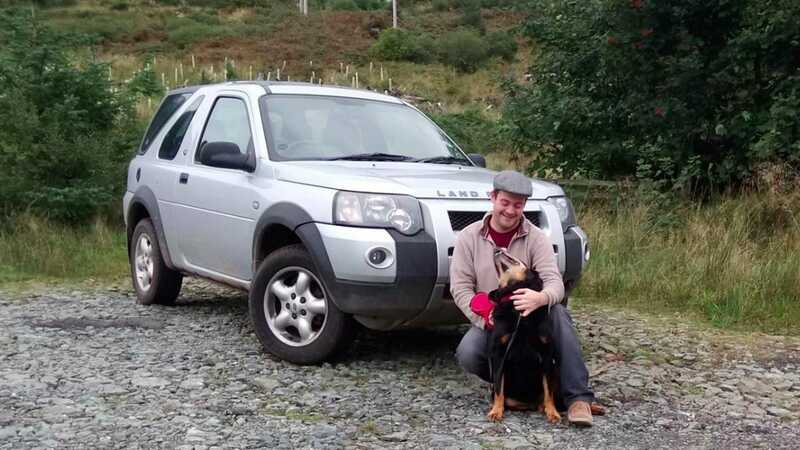 There’s barely enough time to register what’s been said before Ben’s Freelander lurches forward, the engine screaming. Like a manic stallion, it charges towards me. Preparing to jump, I grab the chunky rear-mounted tyre, launch myself at the retreating tailgate and clout my knees on the rear light cluster in the process. I cling on for dear life, breathing heavily and sucking in the intoxicating smell of the hot exhaust bathed in the Forth’s residue. Resting my foot on the tow bar, my shoes dip into the mud as the car again sinks down. The revs build for a second time, and muck coats my jacket and face as giant, sloppy rooster tails spew from all four wheels. It’s a far from smooth ride, and I feel my grip slipping. I can see Ben working feverishly behind the wheel, reflected in the angled wing mirror. The Freelander slides spectacularly as, fearing that we may become beached, Ben drops down a gear, bouncing the revs off the limiter to engage maximum effect from the traction-control system. 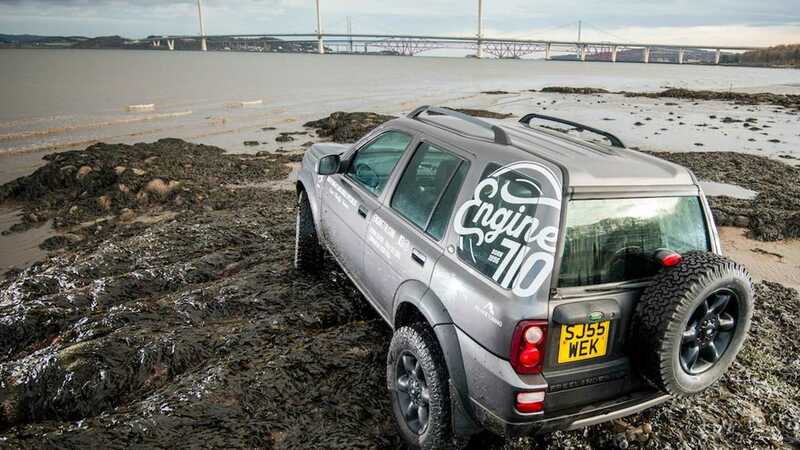 Finally, after several heart-stopping moments, the Freelander hits sand and barrels over the high-tide mark. It may have taken only 10 minutes to complete the challenge, but it was the longest 10 minutes of our lives. We stand with the Freelander ticking over at our side, watching the violent current swallow our trail and pull our plinth under the waves at an alarming rate. Witnessing the tide’s destructive nature at work, we reckon we made it by the skin of our teeth. The hero of the hour stands slathered in all that Mother Nature could throw at its curvy body. Very few off-roaders could have undertaken this venture; I wouldn’t even have been out there in anything other than a ‘proper’ Land Rover. 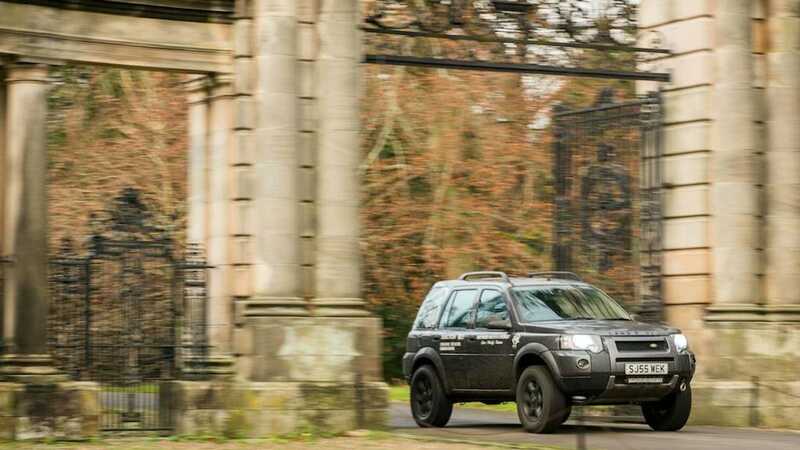 With its authoritative on-road stance, minus a Range Rover’s intimidating size and without the ‘baron’ sensation served up by Granddaddy Defender, the Freelander’s solid controls and driving position tick all the boxes for daily use. 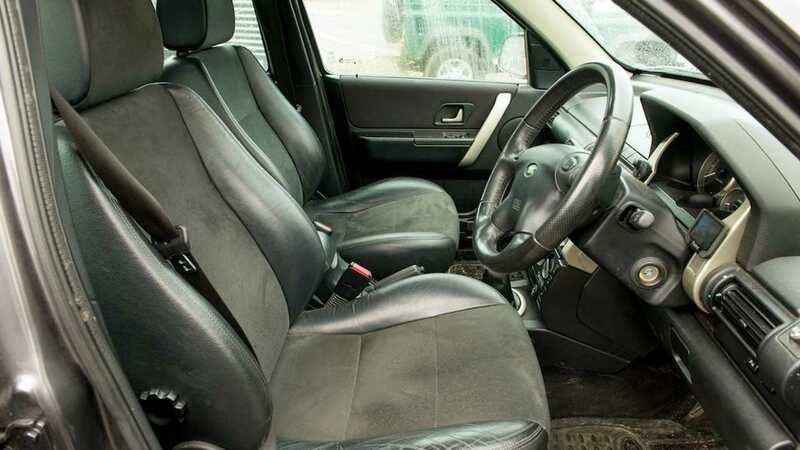 Although the essential Landy feeling remains, the touches of comfort make the Freelander a perfect commuter. The clutch remains light even during repeated use in traffic, the braking system’s great balance gives stress-free stopping, while power from all engine options makes cut-and-thrust urban living a relaxed affair. There is even potential for 32mpg. What more could you really need? While there is a reputation for cylinder-head gasket failure on the K-series petrol engine – available in 1.8-litre four-cylinder and 2.5 V6 form – the unit itself is remarkably easy to maintain and repair. Gearboxes and driveshafts wear well, but without regular servicing you’ll have problems on your hands. Servicing is relatively straight forward, with more than ample space under the trademark castellated bonnet. There is plenty of advice on the dedicated forums, too. 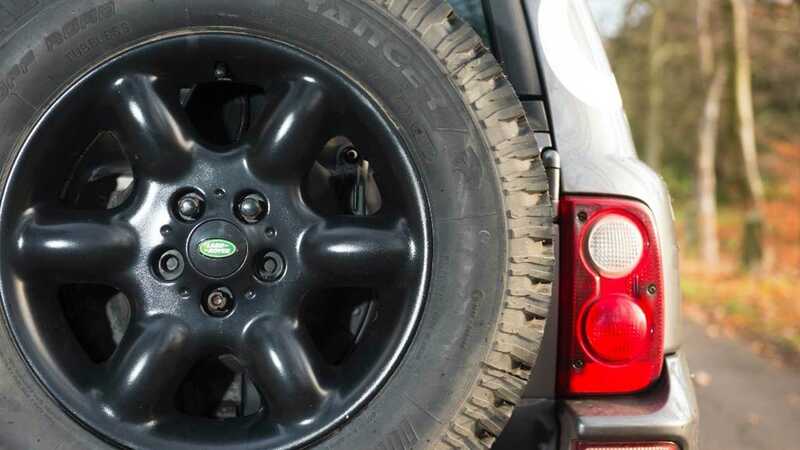 You’d be surprised at the level of activity surrounding the Freelander. Besides several owners’ groups residing on social media, there are frequent club meets, and the baby Land Rover is always welcome at off-road trials, green-laning events and Land Rover shows. The CVC Register has always accepted early examples, and is never afraid to test them properly. Nonsense! 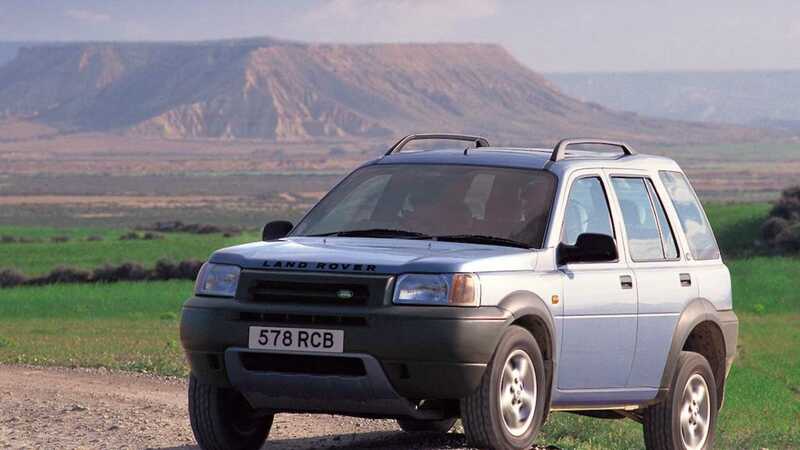 The first-generation Freelander is hugely practical. It has a generous boot space, novel retracting rear window and hidden compartment to stow valuables under the floor. The cabin can easily accommodate five adults, with all manner of cubbies in which to store chocolate, paperwork and emergency supplies. When the weather turns bad, you’re also safe in the knowledge that you will always reach your destination regardless of conditions. Whether taking off for the Alps or Aldi, the little Freelander will prove itself a worthy companion. 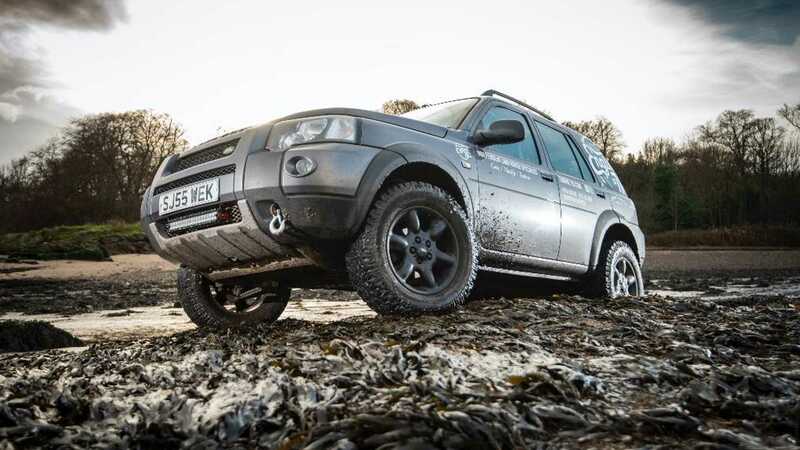 Although the Freelander does without the low-range gearbox found in other conventional Land Rovers, the Hippo is far from flummoxed off the beaten track. 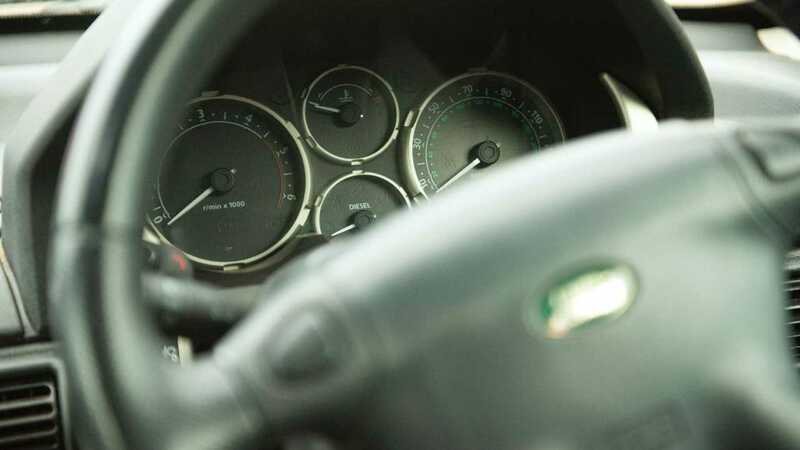 Relying instead upon electronic traction control, the Freelander’s ability remains astounding. It’s capable of tackling the sort of abuse that would leave a Toyota RAV4 or Suzuki X90 beached, and its Hill Decent Control (HDC) keeps everything in check on steep gradients at a steady 4mph. This system was so innovative that it was pinched for the Freelander’s larger brethren, the Range Rover L322 and subsequent Discovery models. 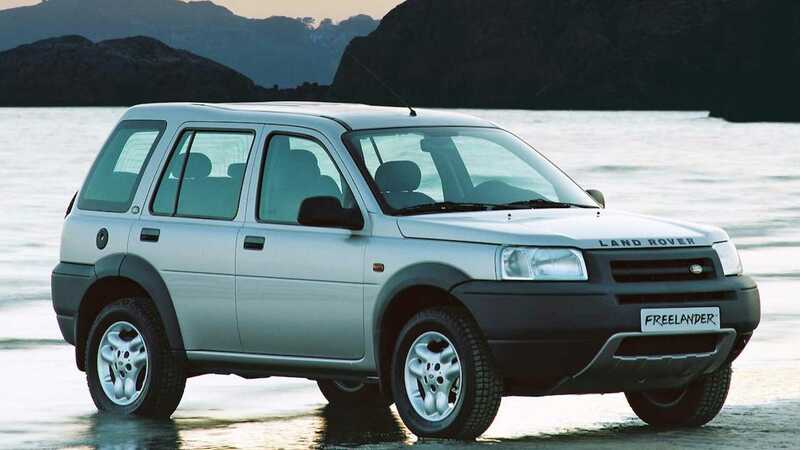 As a hybrid between Land Rover and road car, with ample tuning possibilities, the original Freelander not only set the bar for others to better but also stands as the high-tide mark for charm in the soft-roader market. It may have developed a few foibles as the years have pushed, but with cheeky yet refined road manners and genuine life-saving off-road competence you can have far more fun with this pert 4x4 over any blingy Chelsea tractor. It’s endearingly charming and overtly practical, and any solid example will have your back when the going gets rough. 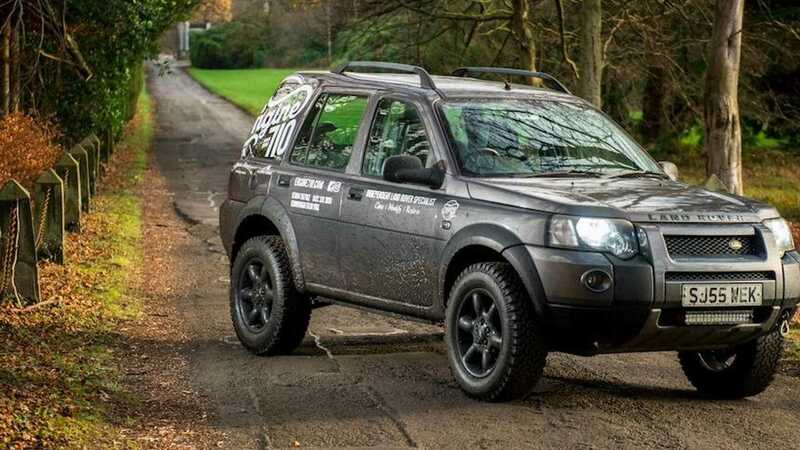 Forget what the bandwagon-riding bashers have to say; the first-generation Freelander is fast becoming a handsome modern classic – and what is a ‘classic’ if not a popular trendsetter with purpose?